Infected leaves harbour the scab spores during the winter, allowing it to reinfect trees during the early spring. The number of spores that survive through winter can be reduced by helping the leaves to break down more quickly. A postharvest treatment of urea is good practice. Application of a Nitrogen foliar fertiliser (ie Low-Biuret Urea) at early leaf fall to increase leaf nitrogen level encourages microbial breakdown of the leaves. 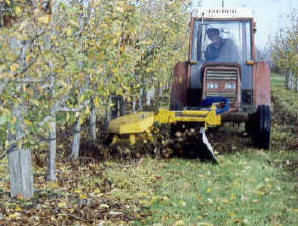 Sweeping and mulching of prunings and leaves in winter is recommended. This can be done in winter after pruning, but should be done well before bud burst. The earlier it’s done, the more likely the leaf matter will breakdown before Spring and therefore reduce spore load. Fallen leaves tend to form a mat in the bare herbicide strip which is then more difficult to breakdown and more likely to hang around until Spring when spore release becomes an issue. Orchards with vegetation in the tree row have an uneven surface which tends not to allow leaves to settle into a mat. However, long grass and weeds may inhibit the breakdown of leaves and also slow maturation of spores. Slashing the weed strip in late winter could help break up leaves and allows enough time for weeds/grasses to grow some new height to potentially inhibit spore dispersal. Following harvest, but well before leaf fall, check levels of leaf infection in all blocks to estimate the potential level of scab which may overwinter and initiate primary infection in the following spring. 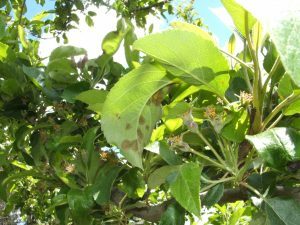 Note that estimates of scab potential based on fruit scab levels are not a good indication of potential scab infection in the following season, because the disease does not carry over on infected fruit. Article reviewed by David Williams (Agriculture Victoria).